The knee is a large complicated joint, which can suffer from many types of injury or wear and tear. Knee pain can be localised; referred from the hip joint; referred from the low back; and it may also develop as a result of foot or ankle injury. We must also be very aware of pain originating from other causes such as blood vessels or nerve tissue disease. Arthritis is common behind the knee-cap (patello-femoral osteoarthritis), but we generally think of 'knee arthritis' as being within the main large joint itself; typically towards the inside joint line more than the outer side. Although also common to other knee injuries, initial pain is frequently described on the inside and deep inside the joint itself. This is often associated with a stiffness, especially a difficulty in being able to crouch, weight bear or to turn corners in a direction that causes a sharp pain. Chronic knee arthritis often stops you being able to fully straighten or bend the knee due to excessive bony overgrowth that has developed over some years. Commonly the knee generally looks 'thicker' as it starts to enlarge and change shape. A history of cartilage or meniscal tears or surgery also gives a high correlation to the predisposition of osteoarthritis within the knee. (In layman's language: injury makes arthritis more likely to occur). Fallen foot arches can also affect the knee joint, as the inside part of the knee will start to twist more than usual while also increasing its natural bend at the side of the knee joint. This increased twist through the knee joint strains the local knee soft-tissues and creates more problems. Medication can only help with some of the swelling, but if want to delay or prevent a knee replacement, you will need to consider how to help it sooner, rather than when it is too late. 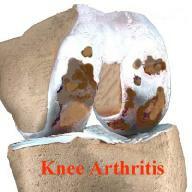 The osteopathic approach to arthritic knees is to give relief and restore function as quickly as possible. The stability of the joint can be helped with specific exercise whilst procedures (including laser therapy) may be used to tackle the pain and inflammation. We have not found a way to prevent arthritis, yet, but one of the easiest approaches is to slow it down before it leads to disability and surgery. It is better+ to consult your osteopath as soon as possible to help prevent deterioration.